It has been so encouraging to receive the overwhelmingly positive responses and reviews of Travis: A Soldier’s Story from soldiers, veterans, nurses, doctors and family members of soldiers and veterans. We are proud to support SSG Travis Mills’s story and in doing so supporting all who are a part of the community of our wounded warriors, their families, veterans and our active soldiers and families who are in the service. Thank you for supporting this film and continuing to share his story! Our family watched this movie as a way to commemorate Memorial Day and show respect for those that have served our country. This is a must watch. God Bless American and God Bless our veterans and military persons! Technically, it’s not a Memorial Day story, but I’m posting it anyway, because I can’t think of a single day when it would be inappropriate to shine a light on Travis. Moreover, I’m going to encourage all of you to watch the documentary about Travis’s unbelievable life, just released on Netflix. Bias aside, this documentary is shockingly good, profoundly inspirational, and really important to see. I won’t say it’s mandatory, because I know how annoying it is to be told what to do. But if I were King of the World, I’d make every network run this film 24/7 until everyone in the country had seen it. (Yes, I’d be that kind of King.) The trailer is posted below. Give it a look, and then watch the movie. You can thank me later. I watched this with my family last night (including kids age 10 and 12). It is a great family-friendly and inspiring account of Travis and the limitless benefits of perseverance, hard work and a good attitude. Highly recommend! Thank you for working on this project Travis; sharing your story is a continuation of your selfless service to our country. Glad for the kind embrace of a War story of love ❤️. Its real cost lived by few. Extraordinary Heroes. My Heroes. Forever grateful and forever blessed. Just watched, and man – you had me crying and then laughing. You are a true inspiration, Travis. This was one of the best documentaries I’ve ever seen. The support system you had was incredible, and now you’re helping others. Incredible. Thank you for your service, humor, and incredible courage. I just finished watching it on Netflix. A deeply moving, raw journey of how God’s gift of a powerful will to not only survive, but to truly live and embrace life. Travis, you and your family are truly blessed. You are all heart ❤️! Thank you for serving and protecting our country and the innocent people of war torn countries. Watched it last night. It was incredibly powerful and inspiring!! It’s just amazing what one can overcome with a strong mind. Thank you for your service!! You and your family are incredible! It’s amazing to see such positivity after such a tragedy. Thank you for your service and inspiring so many people with your story. God bless you and your family. I agree the best movie on Netflix and one up it’s the best true story movie ever. The most touching real life hero movie on Netflix. Travis and family are true inspirations. It was great! I cried, I laughed I loved it! Powerful, inspiring and the strength love, hope and family gave you to overcome… A must watch documentary! So inspiring! It really shows what the human spirit can accomplish! Saw the movie. Shed many tears. I had chills down my spine and tears in my eyes. Every American should watch this and think about what sacrifices have been made and continue to be made by our soldiers. The spirit of this American hero is beyond inspiring. Freedom is not free. It was such an inspiring story!! So beautiful. I don’t know if Travis himself will see this but I just wanted to share what a joy it was to watch this film. I got pretty emotional a couple of times, and not because I’m a girl ? but because of his beautiful spirit and that of his wife, Kelsey. As soon as I finished the movie I bought Tough As They Come and just finished it last night and am truly sad it is over. If he ever decides to write another book I will be one of the first to buy it. I have had some tough times in my life (I’m 45 now so I have some road behind me) and, while mostly optimistic in nature, I live with anxiety and depression which can put a damper in things. I love Travis’s upbeat attitude and the point blank way he sees things. Very refreshing in a time when people in general seem to be a great deal confused on a lot of things. I have shared some short passages to my friends and family here on FB or in conversation, trying to encourage folks and to tell them to buy the book. ? Anyway, as an army veteran and a human being I want to thank Travis, Kelsey and their families for sharing their lives with us in both the film and the book and for their efforts with the Travis Mills Foundation…. Hooah! Such a great movie. I am amazed by his story and his loving family and friends that support him. He has such a strong character that we could all learn from. Just watched it the other night, just amazing and very empowering ???????????? This guy is inspiring, we should all learn something from him! That movie was so good. One of the best movies I have ever seen! Outstanding! Hey y’all – this is a tremendous story…one of many that could be told. Go find this movie. It’s a must-watch. WOW! A very inspiring true story! If you are looking for something to watch, it’s on Netflix now. This is on Netflix now! If you haven’t seen this or heard Travis’s story…WATCH IT!! I heard stories from Stephen, my son in law, about what a great person Travis is and how he kept the guys laughing while they were in Afghanistan. Now he is an inspiration to everyone he comes in contact with and he is still making people laugh with his humor! What an incredible man! I had the pleasure of meeting Travis and I couldn’t be more in awe of his strength, courage, and perseverance! Great movie. All American boy, family, hero! I second that, it was awesome! Watching Travis: A Soldier’s Story on Netflix. Everyone should watch it. We have a lot to be grateful for! Just watched your documentary last night. A lesser man would not be where you are today. You are a true hero and inspiration by your attitude, and your daughter is so lucky to call you “Dad.” We appreciate your service to keep America free and strong. I came across the documentary last week and watched it. I was so amazed & inspired by his story. Your Netflix documentary is incredible….thank you for sharing your life. You are amazing. There are not words enough to thank you and all others for the service and sacrifice to our country. By far one of the best documentaries I’ve seen in a long time! I just watched your doc again. You, your wife, and your family did an amazing thing sharing your story. Have you seen Travis: A Soldier’s Story on Netflix yet? Hundreds of reviews and comments continue to pour in and we can’t get enough! We love hearing what you think of the film, how it inspires you and what takeaways you received from Travis’s inspirational story- so keep ’em coming! Let’s make Travis: A Soldier’s Story a must – see this Memorial Day weekend on Netflix! Got to watch today and I cried, then I laughed, and I cried some more! Thank you, Travis! Thank you to his entire family! Thank you to the company who brought this story to the big screen. Travis, you are an inspiration. I was in the infantry in the 82nd from 07-12 in 2nd BDE. I remember the day we heard of Travis’ injury. I have followed and been inspired by his journey for years and this film hits straight to the core of what it means to be a leader and a good person. Watched it last night, that scene was so good that I thought it was body cam footage, powerful movie, inspiring message, God definitely put you here for a reason, thank you for showing us never to quit and being grateful for life. Wow, this has to be the best Documentary. What an amazing human being Travis is. This is such a great movie! This man is a heroic inspiration! Thank you for your service and sacrifice! You are a true hero not only for what you did on the field but for how you live your life! My husband and I watched this last night. After it was over I noticed a pile of wadded up tissues by his chair. I asked him if he was getting a cold. No, he said. I didn’t realize he wept through the whole thing. 33 years as a firefighter and first responder and he wept through it. ? So impactful. So inspiring. I want to tell you about an incredibly powerful documentary just released on Netflix that’s worth your time. Called Travis: A Soldier’s Story, it’s focused on Retired Army Staff Sergeant Travis Mills of the 82nd Airborne who lost all four of his limbs to an IED explosion in Afghanistan. His recovery and never quit attitude should serve as both an inspiration and a reminder to us all that in addition to those we’ve lost, we must also honor the heroes living amongst us every day. By far the best movie documentary I’ve seen in a very long time. I had the privilege of meeting Travis and his family several years ago. What an amazing story of a quadruple amputee whose story of sacrifice and his never quit attitude will inspire you. I have read his inspiring book and now the movie is available. I promise you will be deeply moved. So inspirational! Travis is a true American hero. His never give up attitude is awe inspiring. Thank you for sharing his story. I just watched your story on Netflix, it really hit home with me. I was in an accident almost 3 years ago that left me a paraplegic, watching you persevere through such enormous obstacles, has lit a fire under my rear. I’ve tried to show others that acquiring a disability doesn’t mean that your life has to stop, you have shown me that your life truly doesn’t have to stop but can take on many other forms! Keep on being someone that people can look to for strength and show them that you only have one life to live, so make it one that you’ll be proud of! Just watched your film and I am speechless. I was moved so much by your story. Thanks for being that guy that just gets it done. You are an inspiration to us all. I watched your movie on Netflix & was so inspired by you. Your story is amazing. I love the scenes with Chloe in the playground. I wish I had half the courage that you have shown, to deal with the trivial issues in my life. I have NOTHING to complain about. Thank you for the inspiration & for serving your country. I am Canadian and I have a renewed appreciation for all that the armed forces do for liberty for all. Saw your documentary on Netflix and I am in awe by the way you approach life. You are an inspiration to all soldiers and you exemplify what it takes to be a leader. I just finished watching the documentary about you and I am even more amazed at what I saw and what I learned about you. You are such an inspiration to me, and to others. You make me feel as though anything is possible if you choose for it to be, it is all a matter of how motivated you are. I was in awe; I laughed and cried throughout the entire film. I have never been so moved by someone’s story in my life. Everything you’ve been through and you still look on the bright side of life. It’s absolutely beautiful. People like you and your story are the reasons I’m pushing myself through school to become a doctor, and I needed a reminder of that last night. I just wanted to thank you for sharing your story. It was an eye opener. Thank you for your service. I am still in awe by your drive and passion. I never usually do things like this but I felt that I have to. I’m a 49 year old Canadian man and I couldn’t be more far removed from your experience. You are truly one of the brightest lights in this world. A gift given to mankind to lift the spirits of people. I can see why your wife loves you so much because I love you bro. You may consider yourself lucky and fortunate but it’s the people that you’ve touched that are truly blessed. You are a force of nature for good. There’s so much evil in the world but thank God for you in particular because you’re one of a kind and you give people something to strive for. Thank you for being the best possible example of the strength of the human spirit. Thank you for making the world a better place for everyone. Peace and love to you, your family and to all of the people whom you have inspired. Just watched your film on Netflix very well done moved to tears throughout. You are one impressive man and soldier. Thank you for all you have done. I just finished watching your film. What an incredible story. Although I may not fully be able to understand what you’re going through, I wanted to reach out to you and let you know that your motivation to ‘Never give up. Never quit’ has resonated with me at a time in my life that really needed a story like yours right now. Thank you for being brave enough to share your story with the world. It will help a countless amount of people overcome various hardships in their life. I watched the documentary about your story on Netflix. I have never been so inspired in my entire life. I learned from your documentary to never give up and to always keep moving forward. I was able to watch the Netflix documentary! I admit I cried! I was very moved by your gracious and persistent attitude and life force!!! You are a truly amazing soul of a human ? I watched and thought, what gives this person the strength and fighting force so deeply and passionately within themselves to push through every obstacle and fight back when at times all others would give it up and move on towards non-acceptance or harsher self punishment that could lead to self destruction… You have shown me that truly the only thing we have to fear in this life is ourselves! THANK YOU!!!! From the bottom of my heart!! For all you’ve done and continue to do. I can’t even put into words how I feel right now. I just watched your documentary and I cried the whole time!! I just watched your documentary on Netflix crying my eyes out! Hit home considering my fiancé is deployed at the moment! Your an awesome family such a strong man with such an amazing wife! Just watched your doc on Netflix. You are an incredible, determined, strong man. Your spirit is amazing. You inspire and give hope. You make an impact. And from a marine wife, I thank you for everything you do! God bless you and your family. May you continue to inspire millions. First of all thank you for your service, you are an inspiration, was in tears watching your film, but were tears of joy, seeing you all that happened to you and turned it to something so positive with a great attitude. God bless you and your family and you are my hero. Awesome documentary!! Thanks for the sacrifice you made Travis! You are a true hero! Keep goring stay positive! I was born with a mild case of cerebral palsy. So I know how it feels when people look at you and than look away fast! Take the negativity and turn it into positive! I try to do that anytime I can! Enjoy listening to your story! Thanks again Travis for what you did for our great country! My wife and I watched the documentary that they did on you on Netflix last night. I must say that it was moving and I shed a few tears. You are an inspiration. I just want to thank you for your service to our country. I watched your documentary on Netflix today and it definitely had me motivated to want to look at my approach on life differently. I just watched your documentary on Netflix. I’ve never written anyone before because I’ve never felt inspired enough to do so. You are a true inspiration. Your mental strength and your dedication to never step pushing forward is the single most impressive thing I’ve ever seen. I wish you the best in everything that you do and I am glad that you shared your story with all of us. God bless you and your family. You are a TRUE leader! I just finished watching your story on Netflix! Should have heeded the warnings of make sure you have plenty of tissue.. i did not.. lol THANK YOU for sharing that! You and your family are truly inspirational!!!!! I’m a “disabled” ARMY combat vet. My disabilities are not physical but emotional/mental. After watching I am ashamed of how what happened to me has paralyzed my life and how you have overcome with what I saw an exceptional attitude! I just got done watching your story, I just want to say you are so amazing, I suffer from depression and your story made me really think of my life. It is an amazing film! Your strength, drive and love of Family are remarkable. Flashes of the sense of humor and love of life that make Travis Mills so unique. Outstanding! Outstanding film! Travis is an amazing inspiration. Not a Netflix subscriber? Travis: A Soldier’s Story is also available on DVD and Blu-ray here. 2 Weeks on Netflix: The Reviews Keep Streaming In! The reviews continue to stream in as Travis: A Soldier’s Story wraps up it’s second week on Netflix. From a personal message from Gary Sinise, to hundreds of shares on our social media platforms, Travis’s message continues to spread and inspire others! If you need inspiration to reach your life goals, face your fears, or simply live another day, stop what you’re doing and watch this film. If you want to see the best Netflix movie of the year!! Check out Travis: A Soldier’s Story! Thank you @ssgtravismills!!! It’s been an honor to watch GSF Ambassador, SSG Travis Mills motivate countless lives by sharing his story, to include mine. I’m excited to share the news that his documentary, Travis: A Soldier’s Story is now available on Netflix. This documentary shows the sacrifice and heroism of one of our nations heroes and his devoted family. I hope you enjoy the film as much as I did. Here I am bawling my eyes out. Even if you can’t watch…..take a minute to be thankful for the men and women who serve. How amazing it is that people volunteer to protect us. What a great film. It is rare to have a true story this amazing to be so well documented in film. Thanks to Travis and his family for being willing to sharing their story. You all did an amazing (understatement) job on this!!! So inspirational!!! ????? Just finished watching SSG Travis Mills on Netflix in his film called Travis: A Soldier’s Story. Do yourself a favor, check it out! Also, do yourself another favor, bring tissues. Great job, Travis Mills ? I wish there was an extended “where are they now” segment to show the fabulous things you’re up to nowadays! Keep it up! Best doc I’ve seen in a long while. Thanks for inspiring me Travis. My elderly dad has Parkinson’s & is only 2 weeks post 2 brutal neurosurgeries. This film encouraged him to keep trying to walk and to never give up, never quit. Thank you @ssgtravismills for your service and for sharing your story and to @fotolanthropy for telling meaningful stories that impact the world. Just watched this on Netflix: “Travis: A Soldier’s Story.” This needs to told on the silver screen. Courage on steroids. My husband and I watched this last night and I am telling everyone I know about it. It was quite emotional. This film is so moving! I saw it in theaters a couple years ago and I’m still brought to tears watching it today. Travis and his family have shown such bravery and love for each other it makes me want to be better. WATCH IT, you won’t regret it. And the music is AWESOME too. We watched it, all I can say is amazing. God bless there family. A must see. Please watch on Netflix. I’ve met Travis Mills and his lovely wife Kelsey Mills Travis is living proof that Great determination can overcome most odds… never, never, never quit and no more excuses…. I am so very proud of you Travis… ????? Travis is as good as it gets. Beyond inspirational. There aren’t enough stars to rate this documentary as it deserves. I knew of Travis but had no idea this had been made and was in theaters a few years ago. Last night I was looking for something to watch, saw this and hit ‘play’ as this wasn’t going to languish in my list of things to watch at some point. I got emotional a couple of times, everyone recounting their parts of the story was so honest. I was a soldier before I was a soldier’s wife and when my husband was deployed to Iraq I was so thankful for that. I don’t know that I would have handled it as well. I met SSG Travis Mills in 2014, and we shared a burger at Hopdoddy’s. I was immediately challenged by Travis’s battle torn body. Travis lost both arms and legs on his third tour of duty in Afghanistan. He was willing to lay down his life for our country so I had to ask myself “What have I sacrificed for my eternal country and King? Am I willing today to give even my body?” (Many followers of Jesus are doing just that even now). Travis and his family’s story was captured by Fotolanthropy in their documentary Travis: A Soldier’s Story which is now on Netflix. It’s a perspective changing film that you must see. If you haven’t seen this yet, what are you waiting for? Such an inspiring story of overcoming the toughest of obstacles and turning it into something positive. Last night I finished my last day of classes. After that, I went home and I watched Travis: A Soldier’s Story. I can’t lie, I felt all sorts of emotions last night and I gotta say… I’m lucky to be alive and have all of my appendages. Ten years ago today I hit a roadside bomb and got shrapnel in my left leg. I’ve got friends who didn’t make it back and friends who have had to fight for a normal life after being injured in the wars of Iraq and Afghanistan. I just want all of you guys to know that you are my motivation to get through everything I’ve been through. I appreciate all of my brothers and sisters from the 82nd Airborne. Thank you all for your service ??? NOW is the time, watch this incredible documentary available now on Netflix! Just watched your movie man!! Unreal!!! Watched it with my daughter and I couldn’t let her go!!! 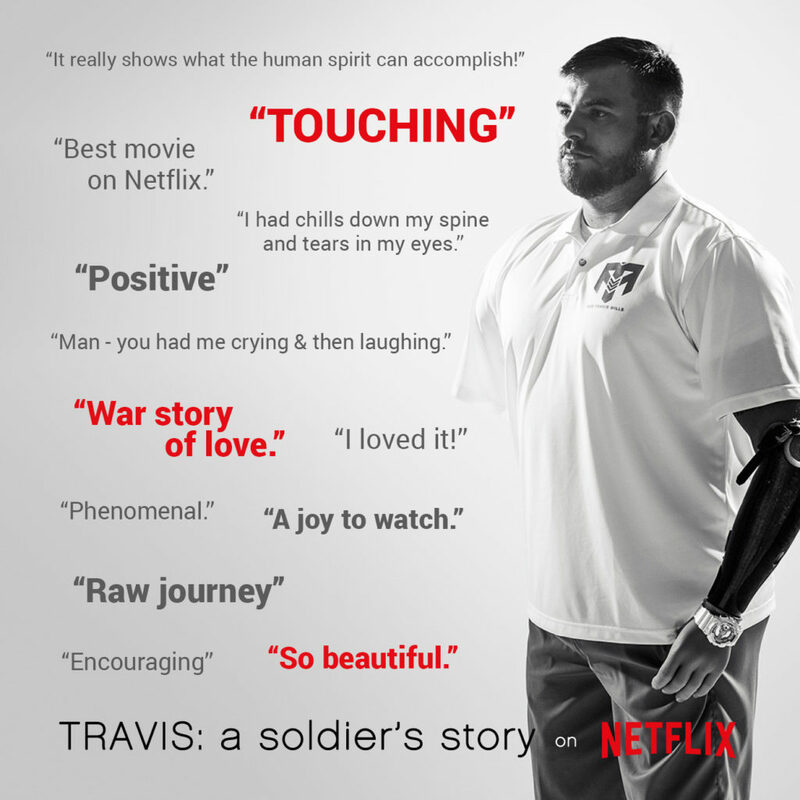 If you aren’t aware of how awesome and inspiring Travis Mills is, you can now view the film about his story on Netflix. His message is “never give up, never quit” and just hearing it will motivate you to live life to the fullest. Saw this on Netflix!! It is so inspirational. SSG Mills is a truly amazing person as are his family members. You are a true blessing. Angels among us. Thank you for your service and thank you for your leadership. Prayers for your beautiful family. Watched it Sunday. What a great American hero! Such an inspiration. 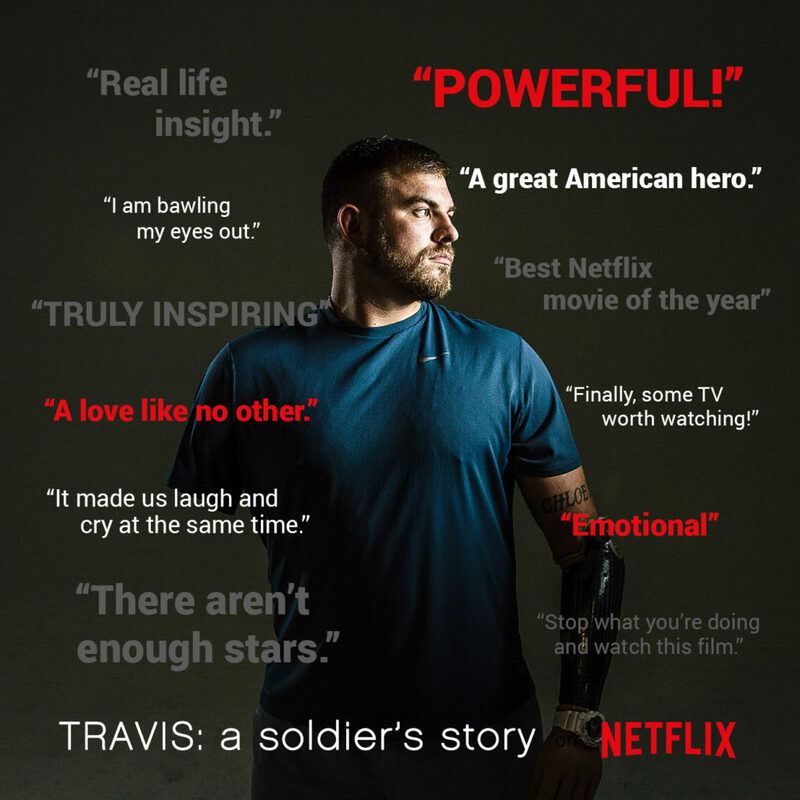 We are excited to announce that our GSF Ambassador, Travis Mills’ documentary, Travis: A Soldier’s Story, is now available on Netflix! Don’t miss watching this quadruple amputee and his family share intimate details of their journey together. Congratulations Travis! A beautiful family that has risen above great trials to become an inspiration to so many!!! Just finished watching. They are an inspiration to anyone going through trauma. Powerful story. Finally, some TV worth watching! Ironic this was on my feed! This documentary Travis: A Soldier’s Story is something EVERYONE should watch! We watched it last night and I am still in awe of this man’s courage and strength! He is nothing short of amazing!!!!! This documentary also provides very real life insight to the risks our service members CONTINUE to take on our behalf! Don’t ever forget it! Have your tissues ready! Very inspiring movie, a must-watch. THIS was my mother’s and my favorite part of the entire documentary. It made us laugh and cry at the same time. True American hero. I didn’t know whether I wanted to smile for the hero he is or cry because everything he has been through. Good bless you Travis Mills and all of the rest of our heroes that have served, serving or just thinking of serving. THANK YOU FOR ALL YOU DO FOR OUR FREEDOM. Since my hip replacement surgery and broken leg (69 years old) he has been my inspiration as I fight to regain my mobility and life… my hero. I just finished watching this and if you don’t watch it, you will miss an incredible movie of strength and undeniable courage and bravery with a love like no other! Have seen it twice and am in awe of this family’s inspiration, will, and total love for one another. I encourage all of my friends to watch this! It’s a beautiful story of persistence and determination. The Mills family is such an inspirational family. For all my PT friends, get a look at how Travis overcame obstacles and has maximized his functional independence given a quadruple amputation through rehabilitation, the help of his wife and daughter and cutting edge technology. Truly inspiring. Their strength is admirable. I just saw this movie. Travis, you are an inspiration. Your story touched me deeply. Just watched this. You brought tears to my eyes. I just finished watching your documentary. You are an amazing person. The mindset you had during your whole healing process is awe-inspiring. I’ve recently had an accident (fell down a flight of stairs, nothing that bad), lots of bruises and pulled muscles and grade 2 sprained ankle. I’ve been stuck on the couch the past 7 days feeling sorry for myself. You’ve made me rethink my attitude, and positivity. I’d just like to thank you for sharing your story. I just saw your documentary on Netflix! Sgt. Mills, you are an inspiration to many people and you have taught me to keep pushing no matter what. You are a very strong person and your story has touched me enormously! Thank you for all you’ve done. You are an amazing person and the reason why I am so proud to be an American. Thank you for your service and showing the world your will to fight and stay strong. Men like you are the reason America is so great. Just watched the documentary. It is as good as you were in person and in your book. Thank you for the inspiration, Travis. Just finished watching. Thank you for your service to our country. You, your family, and your brothers are a true inspiration! What an amazing documentary. Had tears most of the time. Thank you for showing me what tough truly is. Hope to meet you one day brother. Respect. Just finishing up watching this and I love this and his story. He’s truly an inspiration. Thank you for your service. 1 Week on Netflix: The Reviews Are In! We are so humbled by the overwhelmingly positive responses from Netflix viewers, our loyal followers and #travisthemovie fans after just one week on Netflix! We’ve compiled some of our favorite reviews below and are so inspired by the ways Travis’s story has (and will continue to) impact lives across the nation! Keep watching and sharing the inspiration: we read and appreciate every comment, review and personal message you write! This is a must see documentary! I attended the film premiere and watched over 800 people give Travis an emotional standing ovation. It’s an experience that I will never forget. Travis lost both arms and legs while serving our country in Afghanistan, yet he never lost his never give up, never quit attitude. Travis’s spirit is contagious and will gift you with greater perspective on life. This film is for everyone – a tribute to our troops, caregivers, military families and spouses. This film cuts straight to the core of what it means to “never give up” and makes you reconsider the things you once thought impossible or challenging in your own life. So inspired by Travis’s spirit and the ways he has fought for more than just his country, but for his family and their future. I just watched your story on Netflix. It is the most heart wrenching inspirational story. I cried almost all the way through it. My tears in the beginning were sad tears but they quickly went to tears of inspiration. You young man are a blessing on this earth. May you always bring hope to everyone you meet. So very proud of you. God bless. This documentary is a hidden gem and truly one of a kind. I experienced the red carpet premiere of Travis: A Soldier’s Story in Dallas and stood with 800 attendees in ovation to Travis’s courage and this film. I have watched the movement this film has created and it’s been an honor to witness countless people showing their support for Travis and our veterans. This film authentically captures the raw experience of Travis’s life, injury, and recovery. His determination and passion to get better for his soldier’s, wife and daughter will bring anyone to tears and encourage anyone to “never give up, never quit.” Do yourself a favor and choose to be inspired by watching this documentary! Watched it twice already. Beautiful. Just Beautiful. We all cried our eyes out. What an amazing human being and his family – incredible. His positivity is just completely inspiring. God bless him and his family always. I just watched it. I did not think I could admire and respect Travis more than I already did. I was wrong. An amazing documentary… couldn’t take my eyes off the screen. Thank you for your service and continued inspiration to so many who may need a hand up. Watched it last night! Absolutely incredible job they did in this. It’s not just inspiring, it forces you into a different mindset about everyday life. Just finished watching it. I just want to hug your whole family. You are all such beautiful souls! I just watched your story on Netflix, thank you for sharing. In a world that sometimes convinces us it’s easier to give up, you prove it’s not. God Bless you, your spirit, your determination and your gift of helping others. My husband & I watched your documentary last night. You are truly inspiring! Your journey has set the standard to what I believe could touch the lives for so many others in many walks in life. It is such a heartfelt documentary!! Amazing. Glad everyone will get to watch. Congrats y’all! So cool to share your story with so many people. I know it is touching people’s lives and providing so much inspiration. You are awesomely wonderfully wonderful. Your movie… spectacular! Everyone go watch this ASAP. An inspirational story about one of the bravest and kindest men in the world. Fantastic documentary Travis! What makes you a hero and an inspiration is what you have done and continue to do every day to support and bring awareness to veteran’s and their families needs. Rock on brother! I have no words… the pain you and your family have been through is immeasurable. Your story is so captivating and beyond inspiring. So much love and respect for you and yours. An inspiring look at how one can turn a life-altering tragedy into a catalyst for doing good. Travis’s story is one that will make you rethink your own life’s challenges and see beyond your current circumstances in a way that will encourage and inspire others. Thank you for your courage to face things many people would choose not to! The world is a better place because you’re in it! Just watched it for the third time and spreading the word… you need to make a sequel! This documentary captures the raw emotions of a wounded soldier, his family, and all the selfless people who were there every step of the way. His ability and strength to rise above the challenges is truly incredible and one that everyone can be inspired by in choosing to rise above their own challenges in life. Watched this last night! Travis you’re amazing… Your funny personality keeps everyone smiling. Not a dry eye the entire document. ????? Great inspirational story, and so great to have met Travis twice now, see the real person. He is funny, warm and so down to earth. Very good movie! Love your continued high spirits. What a hero, and a wonderful story. Only positive thing I’ve see on Facebook today. This is a great documentary that should not be missed. It will change your perspective on life and make you think twice before you complain about the small inconveniences in your life. Travis is one inspiring guy. This is an amazing true story about how to persevere even through the darkest of times. This is a must watch for all. Makes us thankful for what we have and very inspiration for those going through a rough time. Just finished watching this! ? Very inspiring man! WOW!! I went from ? to ? very quickly!! INCREDIBLE is an understatement!!!! You set the gold standard for strength, perseverance, and inspiration. ? I just watched your documentary!! I cried through the whole thing!! YOU are an absolute amazing man with an amazing smile!!! I cried for what you went through but mostly for the strength and determination you have!! It’s so admirable that it hits you deep in your soul. Your wife is a beautiful woman (inside and out)!! Chloe is beyond lucky to have both you as parents. Wanted to let you know I rated it 5 stars yesterday and I’m telling everyone I know to watch. Watched it with my six year old who met you a few years back… He was disappointed when it was over he said “I want to see more… I am telling all my friends tomorrow at school about it!” He had so many questions. You are amazing thank you for your continued service and sharing your story. Such an awesome and inspiring film. Hard to watch the first time, but it keeps drawing me back. I feel so bad for what our Soldiers go through. You are an inspiration! I have two kids in the military. I’ve told them to watch your story- You are amazing. Helping others is so healing– thank you for being an overcomer and sharing your amazing story! I just watched your story on Netflix and was moved tremendously by your unflagging determination and spirit. Your wife and you are a lucky couple to have each other stand by your through it all and your story is inspiring to keep going no matter how hard the going gets. Absolutely amazing strength and courage shown by both you and your beautiful wife. Many years of happiness wished to you both; you are truly both an inspiration to many……. and god bless your little family….. it is always amazing what the power of true love and the love of a child will do to empower you and drive you! You are living proof! Thank you for serving and for sharing your story. Dear lord I’m watching this right now bawling…. soooo empowering. You and your family are inspiration!!! Very proud to be an American! Travis is one of the absolute biggest inspirations for me! A year ago TODAY was my accident that ultimately lead to me being a bilateral amputee. On my 24th birthday, they ended up amputating both my legs above the knees… I was in such shock that it didn’t really hit me until I was able to get my phone and then I saw the video of Travis.. I started crying uncontrollably when he said the words “it’s going to be okay”. I watched that “Now This” short little video every day for well over a month straight and showed literally everyone. My nurses, physical therapy techs, doctors, family, friends, literally everyone.. I can’t wait to watch this tonight when I get home. Glad it popped up on my feed. Just watched it. They did a great job. Pure story no frilly crap. Thank you Travis. Great documentary, thank you to all who have served and continue to serve to help us stay The Land of the Free and the Home of The Brave. I must say I LOVE how you say “recalibrated” instead of other terms. That is a very cool, and positive mindset! I really don’t know how to say how much every American should watch this film. It is the most brutally honest films you will ever see. Travis doesn’t feel like a hero but I can tell you this if he isn’t a hero then there are none. This whole family is my hero. I watched the film this morning with my son and we are in awe of your determination. Thank you for making my country and world a better place. Thank you for your service. This!!!! Fotolanthropy & SSG Travis Mills, family, soldiers and friends who brought this inspiring and badass, award-winning documentary to the world….THANK YOU! ????? Travis you are more than a hero. The strength in your mind and heart are truly amazing. Your love and commitment to your wife and daughter is a true testament of A TRUE MAN. You are one cool dude and I love your sense of humor. Laughter is great medicine. Your wife is an amazing woman as is the rest of your family. True love is true love. And little miss sunshine there is so grown up and beautiful. Travis I’m so glad your story is being told. I suggest everyone forget about your daily complaints, grab a tissue box, sit down and watch this!!! SSG Travis Mills is the definition of strength, positivity and pure determination! What an incredible and inspiring man!! I admire the men and women who serve and also their families back home who wait and worry and pray!!! I’m speechless – Everyone needs to see this movie. I need more tissues. This documentary can be hard to watch because it is a true story. Yet it’s also one of the most inspiring documentaries you will ever see of one Amazingly Blessed Veteran and his family, and what they’ve made it through. Such strength and will power to never give up is incredibly beautiful. True American Hero, must watch on Netflix. I highly recommend people to watch this documentary. An absolutely amazing story of a man from Vassar, MI that became a quadruple amputee after an IED struck him overseas while he was serving. Definitely proves how much we can overcome and accomplish if we put our minds to it ? All I can say is wow! I just watched the documentary on Netflix and I am speechless. You are such a strong individual. Travis, your determination and perseverance is so beautiful. I had already read your book and cried out of joy and hope and encouragement, but this really was amazing!! Finally made the time to watch this. I was dreading it at the same time I wanted so much to watch! Beautifully done! Have been following Travis’ story since my son’s deployment in 12-13 when I became aware of the many returning service people in need of support. What an inspiring movie. My thanks to all involved for sharing from the heart. Thank you! Such a heartwarming and inspirational documentary that you will not want to miss. It will make you think twice before complaining about the “challenges” in your life. Thank you SSG Travis Mills for your service and sacrifice. God bless you and your family! Thank you Sgt. Mills for your service. I think what makes this film incredible is that you are someone incredible. Not because you made your comeback quickly, or that you were so driven to make your recovery happen sooner than later. Rather, you sir are incredible because you were always filled with love, and joy throughout the entire time. God Bless you and your family. you are all people who inspire incredible greatness. Thank you for your service Travis, awesome doc. By the way, who left the onions out? My eyes started watering for some reason. 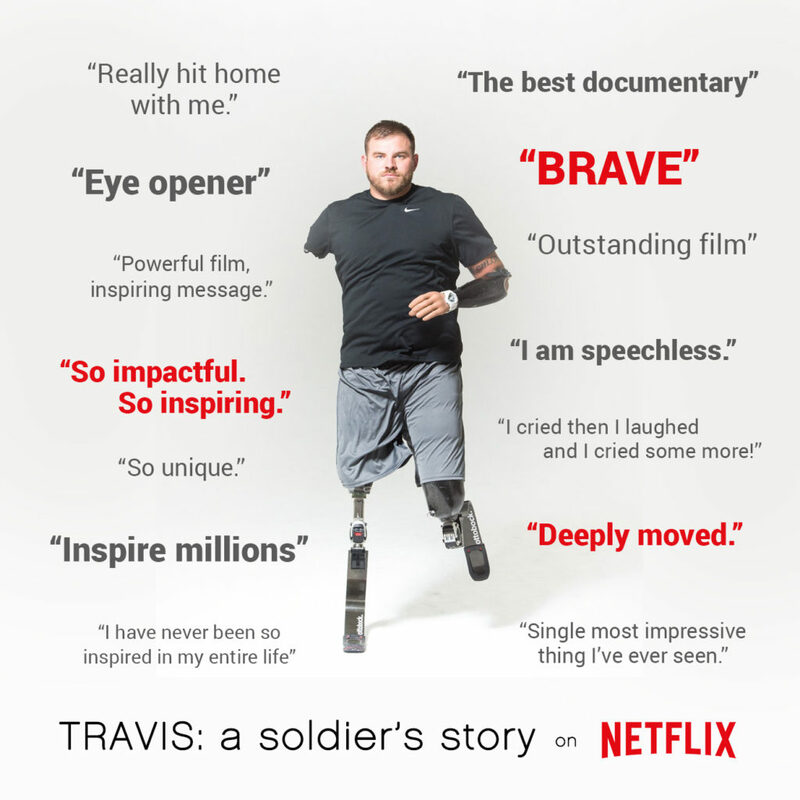 “Travis: A Soldier’s Story” is now available for streaming on Netflix! Got a little “Netflix & chill” on your to-do list? 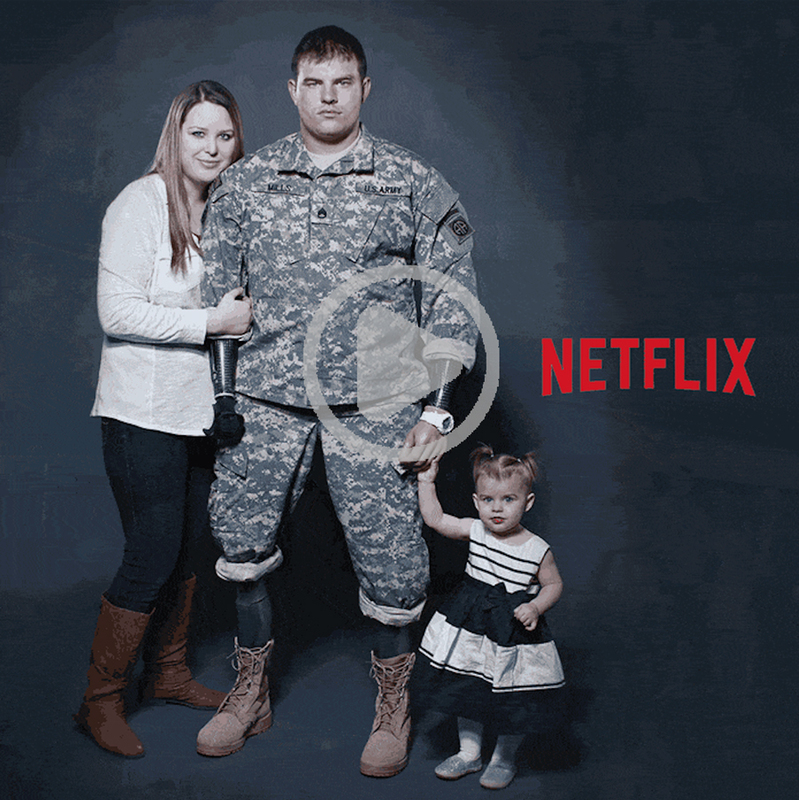 Great news – Travis: A Soldier’s Story is now officially available for instant streaming on Netflix! It’s now easier than ever to share Travis’s powerful Never Give Up, Never Quit story with your friends and family. Here’s what just a few viewers have said about the film . . .
Have you had a chance to see the film? 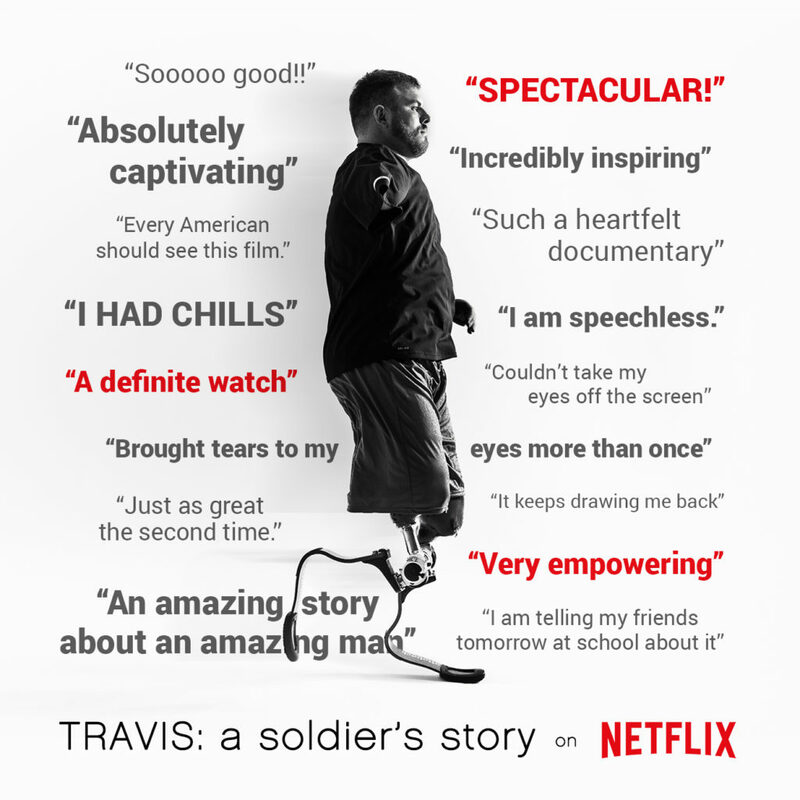 We’d love for you to share your review on Netflix and let others know why they should add Travis: A Soldier’s Story to their must-see movie list! Thank you to all our incredible supporters – from those who backed our Kickstarter project to everyone who has taken the time to share #TravistheMovie with their friends and on social media. It is because of YOU that this film is now available to millions of other viewers across the country! April 2017 marked five years since SSG Travis Mills’ life changed forever. During a routine patrol on “a normal day at work” – as Travis likes to say – in Afghanistan, Travis lost both arms and legs as the result of an IED explosion. Yet Travis refused to let his injury hold him back. While his active duty in the 82nd Airborne came to an end, Travis Mills was just getting started. Just several months after Travis’s injury, the Mills family agreed to share their story with Fotolanthropy. We were so inspired by Travis and Kelsey’s dedication and determination, and Travis: A Soldier’s Story became Fotolanthropy’s first feature-length documentary film. Hundreds of incredible people rallied around this vision to help make the film possible, and there have now been over 75 different screenings of the film, with thousands of people having the opportunity to view the film. 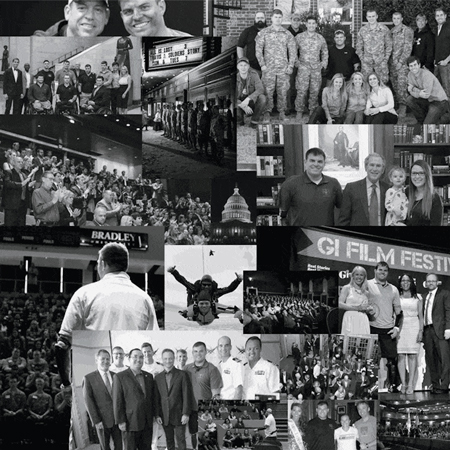 From red carpet premieres, to our nation’s capital, to film festivals, to Travis’s hometown of Vassar, MI, to Walter Reed Medical Center, to various organizations, to schools, and even prisons – Travis’s story has inspired many to examine their perspective on the challenges they encounter in life. SSG Travis Mills visits The Ellen Show! Nearly five years from the date of his accident, SSG Travis Mills had the opportunity to visit the Ellen Show and share his story. Travis appeared along with good friend, and founder of Adaptive Training Foundation, David Vobora. Their visit feature clips from “Travis: A Soldier’s Story”, both Travis and David sharing how their stories became intertwined, and of course – lots of laughs. Travis also announces the gender of Baby Mills, arriving later this summer. Travis and David were each presented with a generous $10,000 donation from Walmart for The Travis Mills Foundation and the Adaptive Training Foundation. We are so proud of both of these men for the ways they are using their personal stories to make an impact in the lives of others struggling with challenging life circumstances! An exciting personal announcement from the Mills Family! The Mills family recently shared some exciting personal news – they’re expecting! Baby Mills will be arriving later this summer. 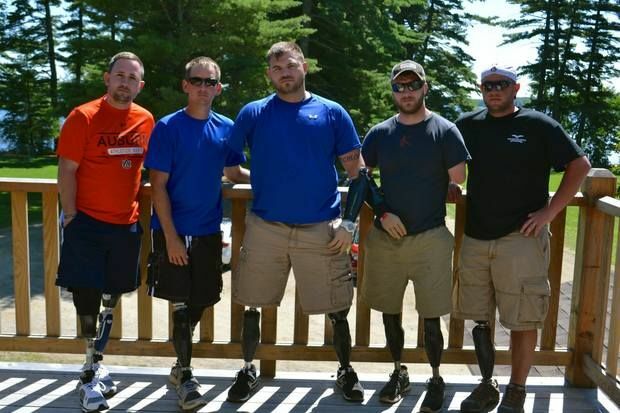 It has been a busy last five years for the Mills as they toured the country sharing Travis’s story, starting the Travis Mills Foundation to help other wounded veterans, and working hard on construction of the foundation’s camp for veterans in Maine, which will open this summer. We are so excited for Travis and Kelsey and we know Chloe is going to be an amazing big sister. Is it a girl? Is it a boy? Watch the clip below to hear Travis announce Baby Mills’ gender during his appearance on the Ellen Show! SSG Travis Mills’ book “Tough As They Come” officially a NYT Bestseller! 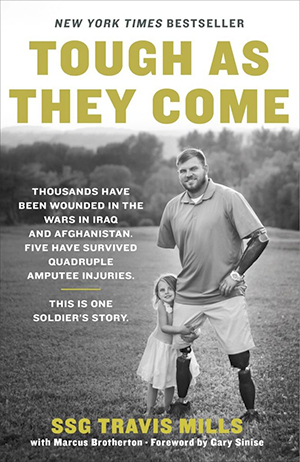 It’s official: SSG Travis Mills’ book Tough As They Come is a New York Times Bestseller! We’re so proud of Travis for his courage in sharing his family’s personal journey through Travis’s accident. Below are what a few readers had to say about the book . . . If you haven’t had a chance to read Tough As They Come you can purchase a copy here – travismills.org/book-paperback The book is an incredible encouraging read for yourself and also makes for the perfect Father’s Day gift, along with a DVD or Bluray of “Travis: A Soldier’s Story”! Have you read the book? Be sure to share your review! The Mills family is always grateful to hear how their story has impacted others. You can share your own review of the book here on Amazon.com by clicking on “Write a customer review”. The Travis Mills Foundation is making huge progress and has so many exciting things happening. We are thrilled to share these upcoming events and progress of several projects with our Travis: A Soldier’s Story supporters. At this time, over $170,500 have been donated to the Travis Mills Foundation retreat project. Thank you to each and every donor who is helping make this dream a reality! To donate, visit the Go Fund Me page. To learn more about this project and see a recent interview of Travis, watch this interview from the Kennebec Valley Forum. It was recorded at the future home of the Travis Mills Foundation Retreat in Mt. Vernon, The Maine Chance Lodge originally built and owned by cosmetics pioneer, Elizabeth Arden. The goal of this retreat center is to allow veterans and their families get away, relax and have fun together in a beautiful setting and a peaceful environment. We are thrilled to support the Travis Mills Foundation, and we cannot wait to share the progress of this process with our Travis: A Soldier’s Story supporters. Travis’s book, Tough as They Come, is available for preorder and will be released on October 27. To learn more about the book and see the book trailer, we invite you to watch more below.